Over the last twelve years in the study and treatment of oral inflammatory diseases, the role of the toothbrush has gained importance as a major transmission factor. Efforts have been made to find a biologically sound toothbrush and to identify effective ways of sanitizing toothbrushes. The objective of this study was to evaluate an ultra-violet (UV) light, daily-use toothbrush sanitizer against the criteria of the Food and Drug Administration's (FDA) requirement for sanitization (e.g. 102 reduction of microorganisms). Twelve sterile clear toothbrushes were used for each microorganism . 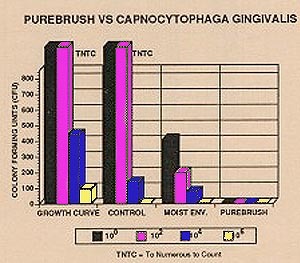 Candida albicans, Beta-Hemolytic Streptococci, and Capnocytophaga gingivalis were used to inoculate the study toothbrushes. Two toothbrushes per microorganism were plated immediately after inoculation as controls; five toothbrushes per microorganism were placed in a humid bacteriological hood to simulate a bathroom environment, and five toothbrushes per microorganism were place in the UV light sanitizer. All toothbrushes were sonicated in and plated on appropriate media; colony forming units (CFU) were counted after 24 and 48 hours. A minimum of 1x102-4 CFU reduction of microorganisms was observed with the UV treated toothbrushes inoculated with Candida albicans and Beta-Hemolytic Streptococci as compared to moist environment and control toothbrushes. 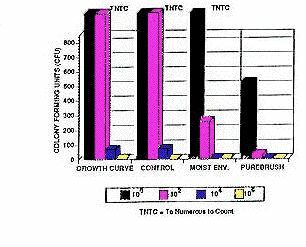 No Capnocytophaga was observed on the UV treated toothbrushes, while 3.0X106 CFU of Capnocytophaga were observed on the moist environment toothbrushes. The Purbrush UV Light Toothbrush Sanitizer was found to be effective in eliminating or in reducing the numbers of microorganisms found on the toothbrushes after only 24 hours. This study was supported by summer student/mentor program of the J. Dean Robertson Society. 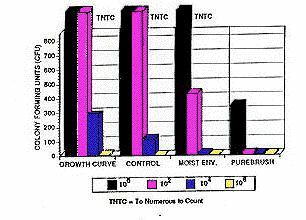 To achieve the above objective, growth curves for each of the microorganisms were observed. The growth curves were determined by streaking known dilutions of microorganisms on Blood agar, Sabouraud Agar and Laked Blood Agar at dilutions of 1x102, 1x104, and 1x106. The rates of growth for 24 and 48 hours at 37C were recorded. The plates were streaked in duplicate and the number of colony forming units (CFU) were recorded for the two plates and averaged to reduce the possibility of skewed data. Twelve Oral B two row clear toothbrushes were sterilized using ethylene oxide and were contaminated by immersing each toothbrush in a known concentration of a microorganism for ten minutes. The toothbrushes were tapped to remove excess liquid. Two toothbrushes were sonicated and plated immediately as controls. Five toothbrushes were placed in the moist environment for 24 hours. All toothbrushes were sonicated in 5 ml of the appropriate broth for one minute to recover the microorganisms (Todd hewitt Broth for Beta-Hemoloytic streptococci, Sabouraud Broth 4% for Candida albicans, Brain Heart Infusion Broth for Capnocytophaga species). The recovery media was streaked on plates in duplicate to determine the number of CFU at dilutions of 102, 104, 106. One colony from each plate was gram stained to certify the microorganisms were those listed.